I hope this email finds you well. It has been just over two years since I took office as your Lake County Board representative and Forest Preserve Commissioner and it has been a rewarding experience. In December I held twelve open-office hours and public information sessions across my district, and I appreciated hearing the questions, concerns, and feedback about living and working here in Lake County. If you were unable to attend and would like to me to speak with me, please let me know. In addition to my previous committee assignments I am the vice-chair and chair for the Ethics Committee for both Lake County and the Forest Preserves, respectively, and am the Forest Preserve liaison for the Illinois Assoc. of Park Districts. I am also a member of the newly-formed Behavioral Health Treatment Court Collaborative (BHTCC), created to combat the moral, ethical, and financial problem of housing the mentally ill in our jails. Medical professionals, judges, law enforcement, and non-government agencies are working together to provide people in need the services they require to keep them healthy and out of our criminal justice system. This is a national issue and Lake County has been a leader in this area with the problem solving courts, which we are working to expand. I continue to serve on the Lake County Opioid Initiative, and we have several legislative initiatives underway for 2015. In 2014, we worked with law enforcement agencies to ensure that officers are trained and outfitted with Naloxone, a drug that is given to reverse the effects of a heroin overdose. On New Years Day, Deerfield police officers saved the life of a young woman who was overdosing. We also received approval from the Drug Enforcement Agency and Illinois Environmental Protection Agency for SWALCO to destroy unresidual pharmaceuticals, resulting in cost savings to our county. It is a pleasure to serve you on the Lake County Board and the Forest Preserve Board. If you have any suggestions or questions, please don't hesitate to contact me. One of Lake County’s greatest opportunities is public transportation. In many areas of the county, there is little or no opportunity for people to use public modes of transit to get to work, medical appointments, school, or shopping. This is a significant issue for our seniors, disabled, and low-income residents, but affects all of us. CMAP reports that a strong public transportation service is necessary to attract young people to live and work in Lake County, and is a factor when companies determine where to locate. Because of these important issues, there has been a region-wide effort to create a borderless system that is sustainable, efficient, and affordable. Yesterday I attended a meeting with township supervisors, Pace, and Lake County Department of Transportation to discuss a $328,000 RTA grant that was awarded to our area to expand existing public transportation services. We are excited for the opportunity this brings to our residents, the collaboration between different government entities, and our progress toward a seamless, affordable public transportation in Lake County. If you are a senior or are disabled, please contact your township office for more information about Dial-A-Ride services. ​On January 13th, the Lake County Board approved an economic incentive package to bring Akhan Semiconductor, Inc., to Gurnee. The agreement lasts five years and sets maximum rebate amounts and requires the company to meet certain targets to be eligible for a sales tax incentive. The County Board was one of many state and local government entities that worked together to successfully attract Akhan to the area by collaborating on income, sales and property tax abatements. Lake County is working closely with Lake County Partners to complete the framework for when incentives should be offered, ensuring that we are protecting our existing businesses and residents by only offering incentives to those businesses that meet specific criteria. Akhan plans to bring 250 high-tech jobs over the next three years, which will help stimulate growth, encourage business expansion, and increase sales tax revenues over the long term. Since the passage of the Illinois Electronic Products Recycling and Reuse Act in January 2012, certain electronics (for example, televisions and computer equipment) are banned from our landfills and must be recycled. In the last few years, we’ve had drop-off locations scattered across the county, and Lake County recycled more electronics than any other county in the state. In 2014 alone, we recycled almost 5 million pounds, approximately 67% of which were TVs and monitors. Due to recent changes in this law, it has become necessary to consolidate some of our drop-off locations, and there are now only six SWALCO-supported locations in Lake County. Click here for the current list. Please note that Lake Bluff residents can recycle electronics at Midwest Electronics. Help reduce landfill space by bringing old or unwanted textiles of all kinds to one of Lake County’s Textile Drop off Boxes, to be repurposed or recycled. The EPA estimates that the average person throws away 70 pounds of clothing each year, and that 5-10% of all waste sent to municipal landfills is comprised of textiles. SWALCO will accept ALL fabric clothing and textiles, even with stains or holes. Approximately 95% of the materials collected will be repurposed or recycled. The Chicago Wilderness alliance recently recognized Middlefork Savanna Forest Preserve in Lake Forest with a Platinum Award (the highest level) for excellence in in conservation leadership and restoration. This preserve features a 26-acre rare tallgrass savanna and supports an impressive list of uncommon birds, butterflies and other species that require large open areas for survival. Middlefork also serves as a national ecological research site and outdoor classroom for universities, schools, and other organizations. Sneak some learning into your child's summer adventures with Summer Camps through the Lake County Forest Preserve District. Registration for the 2015 camp season is open with early bird discounts available through Feb 15, 2015. Programs fill quickly so enroll early. Browse all available camps and register online or by phone at 847.968.3321. Students and their parents can get help and learn about financial aid by attending free FAFSA Workshops (Free Application for Federal Student Aid) available at various locations throughout Lake County through March. For more information contact C.Myra Gaytan-Morales, Assistant Dean for Academic Programs and Services, University Center of Lake County at 847.665.4108 or mgaytan@ucenter.org. The University of Center of Lake County on the CLC Campus in Grayslake is offering new programs through a consortium of colleges and universities, including Master of Organizational Leadership, Master of Science in Education in Instructional Technology, Certificate in Web-Based Learning, and an accelerated RN to BS. Visit the University Center’s website for more information. 5 Steps To Your Next Job! Attend some or all of a 5 day interactive workshop series and get help building your resume, sharpen your interview skills, and find dynamic opportunities. Attend all 5 days and receive a Job Center Certificate. Watch a video to learn more about what to expect at this helpful workshop series. The Lake County Board’s Summer Youth Employment Program offers low-income youth the opportunity for paid, part-time summer work experience. Youth are matched with local worksites and gain valuable experience while earning a pay check. Applications are available beginning on Feb. 1 online or at the Lake County Job Center in Waukegan and are due on Feb. 28. For more information, visit www.lakecountyjobcenter.com. 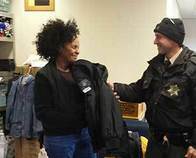 Rangers from the Lake County Forest Preserves recently reached out to veterans in need by donating an assortment of uniform jackets, shirts and pants that were no longer in use. The donation was coordinated with the Waukegan-based Lake County Veterans Assistance Commission and will be distributed out of the Midwest Veterans Closet in North Chicago, where veterans shop for free.